Cortona is a beautiful city on a hill. Frances Mayes made it very popular with her book (later a movie) Under the Tuscan Sun. 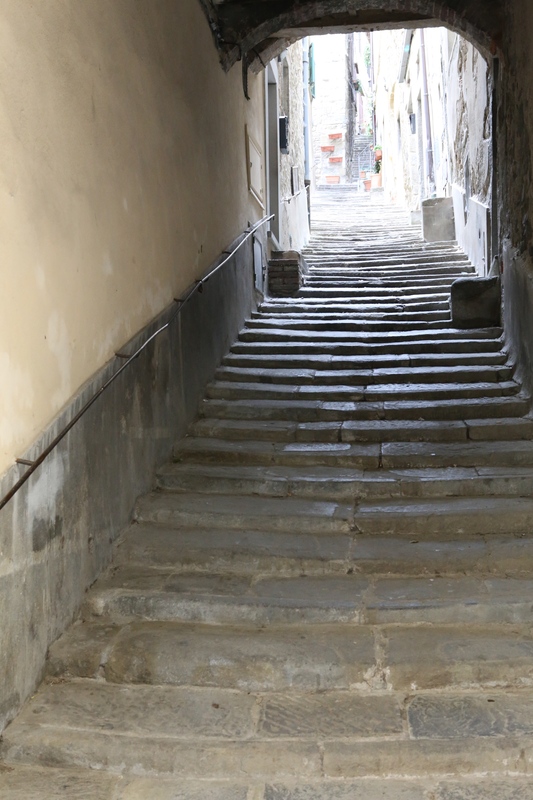 Like all the small hill towns we will talk about, it has narrow streets, stairs and small piazzas. 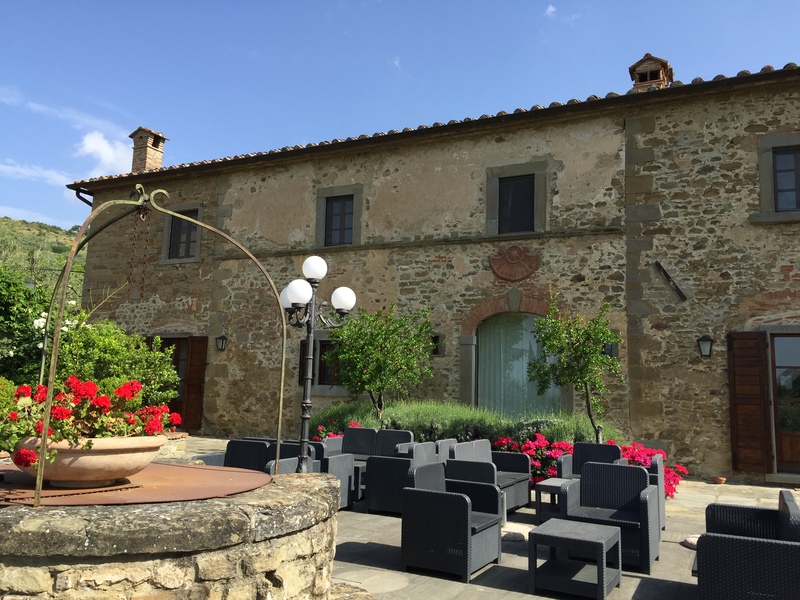 We stayed outside Cortona in a beautiful hotel on a huge piece of property called Borgo San Pietro Hotel. GPS doesn’t work getting here. We ended up at a Etruscan ruin. On the way back towards Cortona we saw a sign for the hotel. It led us onto a dirt road (barely passable by one car) and to the gate onto the hotel property. As we arrived in a large parking area, a hotel person met us and took our suitcases to our room. 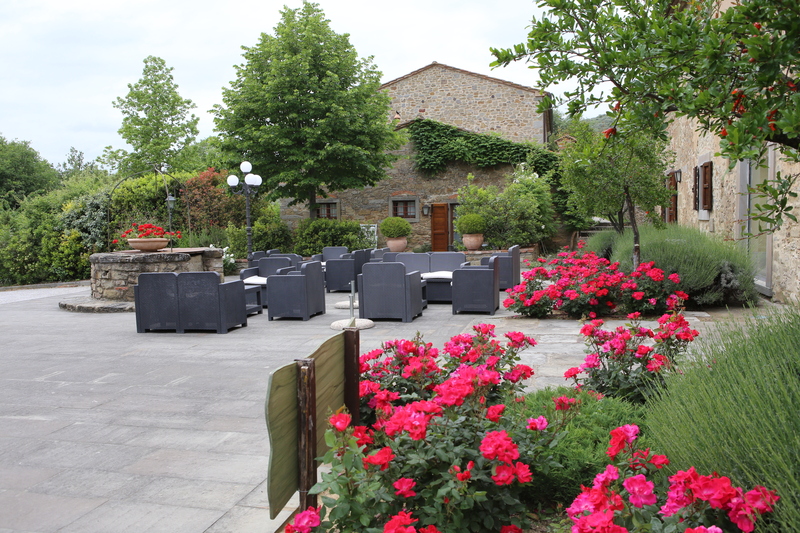 Cortona is another place where you park on the edge of town and walk in. Parking is easy here. The church in the movie had a fountain near it and a Christmas Tree. The actual piazza has no fountain and is smaller than it seemed in the movie but the steps to the church in the movie were real (see picture at end). We found an outdoor cafe/bar to have a snack and some Prosecco. As we sat there, we heard band music coming from behind us. 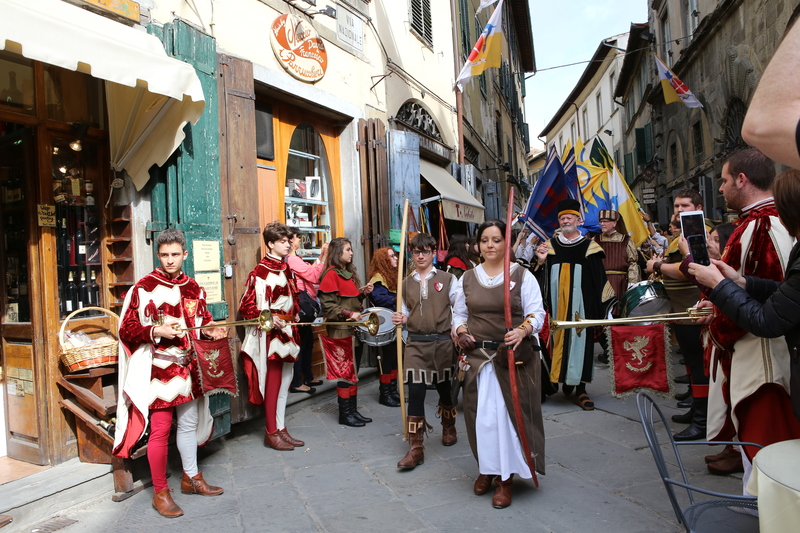 soon a very large marching band was there dressed in medieval customs with flag throwers. 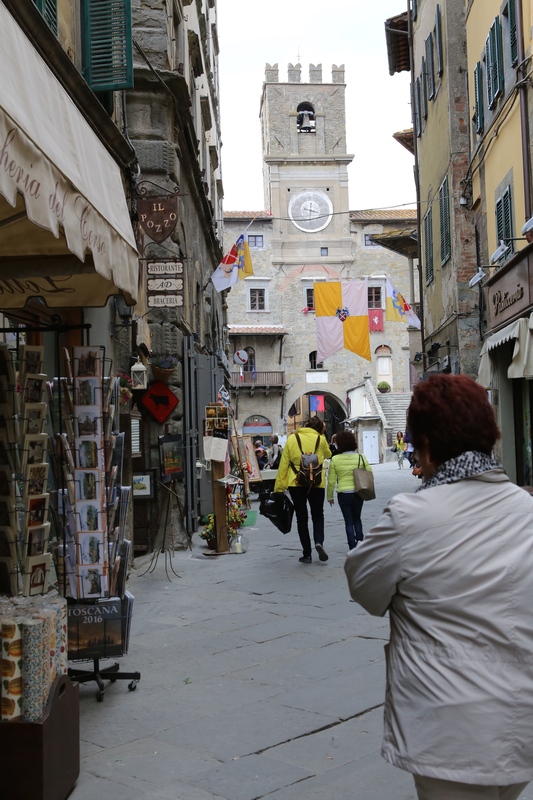 Walking around Cortona is fun. The narrow streets take you back to another time. This is a place to be on your own and not in a tour. You can wonder where you like. You can shop, stop for a drink or have a meal where and when you like. Tomorrow we are off to Montepulciano and its famous wines. 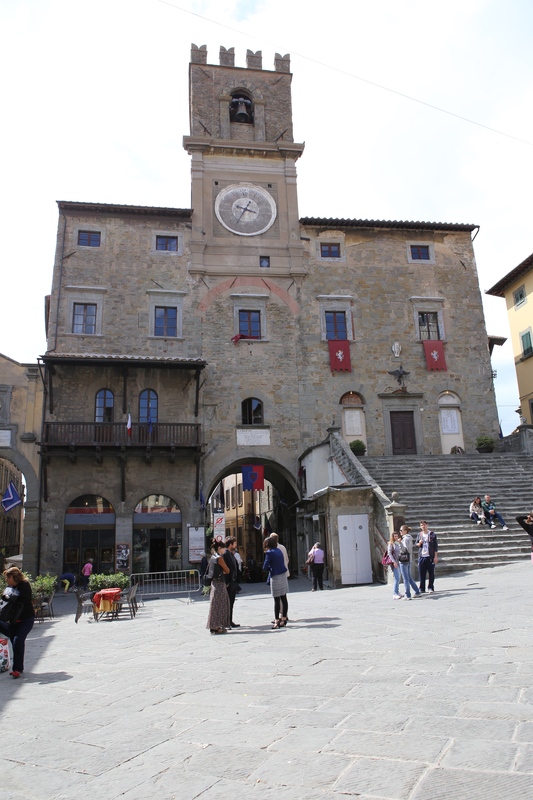 I stopped in Cortona for lunch on the way from Florence to Pievebovigliano a few years ago. It is another lovely hilltop town. I must return. I have never been to Pievebovigliano, how is it?